Super Fun this 18' Water Slide will be the perfect addition to your next event. Make your event into the best party in your neighborhood with one of our most popular inflatable Water Slides. Cool Down with this summer with our 18' Water slide! Make your own Water Park in your backyard! 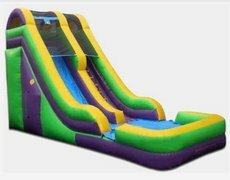 Everyone of all ages will love this 18' slide with easy grab straps on the sides! This inflatable water slide is a perfect addition for any summer outdoor event or party!